عشقی, حبیب‌اله, روحانی, ابوالقاسم کامکار. (777). برداشت، پـردازش و تفسیـر دادههای GPRبرای شناسایی رسوبات زیرسطحی در سواحل جنوب‌شرقی دریای خزر. 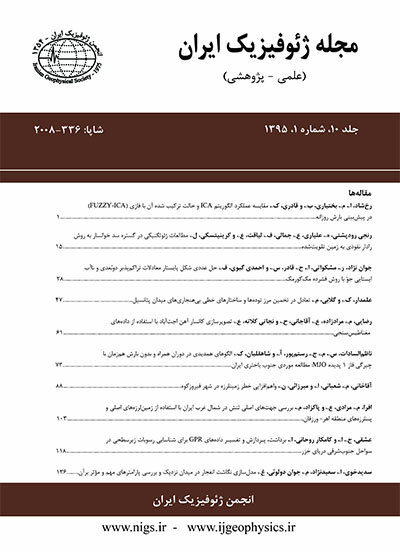 مجله ژئوفیزیک ایران, 10(1), 118-135. حبیب‌اله عشقی; ابوالقاسم کامکار روحانی. "برداشت، پـردازش و تفسیـر دادههای GPRبرای شناسایی رسوبات زیرسطحی در سواحل جنوب‌شرقی دریای خزر". مجله ژئوفیزیک ایران, 10, 1, 777, 118-135. عشقی, حبیب‌اله, روحانی, ابوالقاسم کامکار. (777). 'برداشت، پـردازش و تفسیـر دادههای GPRبرای شناسایی رسوبات زیرسطحی در سواحل جنوب‌شرقی دریای خزر', مجله ژئوفیزیک ایران, 10(1), pp. 118-135. عشقی, حبیب‌اله, روحانی, ابوالقاسم کامکار. برداشت، پـردازش و تفسیـر دادههای GPRبرای شناسایی رسوبات زیرسطحی در سواحل جنوب‌شرقی دریای خزر. مجله ژئوفیزیک ایران, 777; 10(1): 118-135. در این مطالعه که بر روی رسوبات حاشیه جنوب شرقی دریاچه خزر انجام شده، سعی بر آن بوده که با اعمال پردازش‌های مختلف بر روی داده‌های رادار نفوذی به زمین (GPR)، اثر هر یک از پردازشها بر روی داده‌های مذکور مورد بررسی قرار گیرد. با توجه به تعداد بالای پروفیل‌های GPR برداشتی در این تحقیق و امکان استفاده از هر یک از پردازش‌ها در جای مناسب خود، امکان درک شهودی نحوه پردازش داده‌ها برای شرایط و اهداف متفاوت فراهم شده است. به‌علاوه در این مطالعه ضمن بررسی نحوه اثر هر یک از پردازش‌ها و سازوکار عمل هر یک از عملگرها بر روی داده‌های GPR، با انتخاب پارامترها و روندهای پردازش مناسب سعی بر بازسازی و ترسیم بهترین مقطع ممکن بوده است؛ ضمن این که با بررسی مقاطع GPR، ردهای جداگانه، میانگین طیف بسامد و میانگین دامنه بر حسب زمان، به درک صحیحی از موفقیت و یا عدم موفقیت یک روند پردازشی می‌توان رسید. Ground penetrating radar (GPR) method as a high-resolution non-destructive geophysical method acts based on the transmission of relatively high-frequency electromagnetic waves inside the ground and recording the reflected waves from the interfaces between the subsurface layers. As the method uses electromagnetic waves in the frequency ranges of 12.5 megahertz to 1 gigahertz (called GPR waves), it can only be used for shallow subsurface investigations. As a result of fast and dense data measurements in this method, continuous images of the reflections of GPR waves from the interfaces of subsurface media with different electrical or electromagnetic properties are obtained. These properties comprising of dielectric constant (or relative permittivity), electrical conductivity and magnetic permeability play key roles in GPR responses. The GPR equipment measures the travel time of the waves. Thus, the preliminary display of the acquired GPR data is in the form of a time section in which the vertical axis indicates the two-way time taken from the transmission of the GPR wave by the transmitter into the ground until its reflection and receipt by the receiver. GPR method has been successfully used in a variety of applications including hydrogeological investigations, mapping of bedrock surfaces, and detection of subsurface targets such as buried pipes, cavities, foundations, subsurface contaminations, waste deposits, water tables, soil horizons and other subsurface interfaces or targets. In this research, GPR method has been used to examine the subsurface sediments in southeast margin of the Caspian Sea. After acquiring the GPR data along a large number of relatively long survey lines in the study area, effort has been made to apply various processing techniques to the acquired GPR data in order to investigate the effect of each of processing techniques on the data enhancement. Considering the collection of vast GPR datasets along different long survey lines in the study area containing various subsurface targets with different depths and sizes, the results or performances of applying each of the processing techniques to the GPR data have not been similar. Due to the low distance between the GPR transmitter and receiver as well as the electrical properties, especially the conductivity of the ground, and also, to remove the unwanted low-frequency signals or reflections while preserving the highfrequency signals, the dewow filter has been applied before any other processing to all the GPR datasets. The short time intervals between the transmitted GPR pulses and the pulses received directly from the air-ground surface, and also, the existence of reflections from the shallow subsurface targets, cause signal saturation in the receiver. For this, the dewow filter is applied to the GPR data to correct for signal saturation or wow in the data. Different types of gain are also among the processing methods applied to the data to reduce the attenuating effect of the GPR waves as the depth increases. To demonstrate the effects of different gains and to select the optimum gain, we have applied different gains to the GPR data. To convert the trace from a wavelet with both positive and negative components (i.e., sine or cosine nature) to a monopulse wavelet with all positives, we have used the envelope filter. This process removes the oscillatory nature of the radar wavelet and shows the data in its true resolution, making it easier to interpret. To determine the locations of the GPR events, the GPR time section should be converted to its corresponding GPR depth section in which the vertical axis shows the depth. To do this, it is necessary to know the velocity of the GPR wave in the subsurface structures of the area under study. This research indicates that using the characteristics of GPR waves in the GPR sections, we can detect the subsurface targets and discriminate the coarse-grained sediments from the fine-grained sediments, and also determine the electrical properties of subsurface layers with high success. High resolution of the GPR data has enabled us to characterize most of the subsurface sediments. Furthermore, the shallow subsurface bedding can be easily observed in the GPR sections obtained. High moisture, salinity, clay and silt contents of the shallow subsurface sediments cause high conductivity of the ground in the area, and thus, cause the depth of penetration of the GPR waves to be mostly less than 1 meter. اویسی موخر، م.، قاسمی، و.، و شاه‌نظری، ح.، 1384، مطالعات مغناطیسی و رادار بر روی طاق‌های عمارت تاریخی خسرو در شهر قصر شیرین: دوازدهمین کنفرانس ژئوفیزیک ایران. اویسی موخر، م.، ،1386بررسی ساختار شکستگی سراب قنبر در جنوب شهر کرمانشاه با استفاده از روش رادار: مجله ژئوفیزیک ایران، جلد ،1شماره ،1صفحه 81 -89. حسینی، م.، 1388، برداشت، پردازش و تفسیر داده‌های رادار نفوذی به زمین GPR در منطقه شاهرود و مقایسه نتایج آن با نتایج ژئومغناطیس در منطقه مزبور: پایان‌نامه کارشناسی ارشد، دانشکده مهندسی معدن، نفت و ژئوفیزیک، دانشگاه صنعتی شاهرود. محمدی ویژه، م.، ،1387برداشت، پردازش و تفسیر داده‌های رادار نفوذی به زمین در منطقه شاهرود و مقایسه آن با نتایج ژئوالکتریک در منطقه مزبور: پایان‌نامه کارشناسی ارشد، دانشکده مهندسی معدن،نفت و ژئوفیزیک، دانشگاه صنعتی شاهرود. مزینانی، ا.، 1389، بررسی ضخامت آسفالت در دانشگاه صنعتی شاهرود با استفاده از روش :GPRپایان‌نامه کارشناسی ارشد، دانشکده مهندسی معدن، نفت و ژئوفیزیک، دانشگاه صنعتی شاهرود. Annan, A. P., 2001, Ground penetrating radar workshop note: Sensors and software. Davis, J. L., and Annan, A. P., 1989, Ground-penetrating radar for high resolution mapping of soil and rock stratigraphy: Geophysical Prospecting, 37( 5), 531–551. Fisher, E., McMechan, G. A., Annan, A. P., and Cosway, S. W., 1992, Examples of reverse-time migration of single-channel, ground penetrating radar profiles: Geophysics, 57, 577–586. Kofman, R., Ronen, A., and Frydman, S., 2006, Detection of model voids by identifying reverberation phenomena in GPR records: J. Appl. Geophys., 59(4), 284–299. Neal, A., 2004, Ground penetrating radar and its use in sedimentology: Principles, problems and progress: Earth-science Reviews, 66, 261–330. Reynolds, J. M., 1997, An Introduction to Applied and Environmental Geophysics: John Wiley, 806 pp. Sensors and Software, 1999a, pulseEKKO 100 RUN Userʼs Guide, Version 1.2. Sensors and Software, 1999b, Win_EKKO Userʼs Guide, Version 1.0. Yilmaz, Ö., 1987, Siesmic Data Processing: Vol. 1: Soc. Explor. Geophys.